The sixth annual Cloud World Forum wrapped up yesterday and here’s what the event tells us about the state of cloud IT in the enterprise world. OpenStack’s big users and providers claimed the cloud technology is truly enterprise-ready because of its freedom from vendor lock-in and portability features. Big internet companies such as eBay are running mission-critical workloads on OpenStack cloud. Even smaller players such as German company Centralway is using open source cloud to power its infrastructure when TV adverts create load peaks. HP says it is “all in” when it comes to OpenStack. It is investing over $1bn in cloud-related products and services, including an investment in the open-source cloud. RedHat has just acquired eNovance, a leader in the OpenStack integration services for $95m. Rackspace and VMware are ramping up their OpenStack services and IBM has built its cloud strategy around OpenStack. Skills shortage around developing OpenStack APIs into a cloud infrastructure seems to be the only big barrier hindering its widescale adoption. Cloud marketplace is fast becoming an important channel for cloud transactions. According to Ovum analyst Laurent Lachal, company JasperSoft gained 500 new customers in just six months with AWS marketplace. Oracle, Rackspace, Cisco, Microsoft and IBM have all recently launched cloud services marketplaces. What it means to the users? Browsing the full spectrum of cloud services will become as easy for customers as browsing apps in the Apple App Store or Google Play. “As cloud matures, established marketplace seems like a logical evolution. It is a new trend but it gives users a wealth of options in a one-stop-shop kind of way,” said Lachal. Bank of England CIO John Finch, in his keynote, warned users of “pesky vendors” and cloud providers’ promises around “financial upside of using the cloud”. Legal experts and top enterprise users urged delegates to understand the SLAs and contract terms very clearly before shaking hands with the cloud providers. Cloud is leading to the rise of Shadow IT and CIOs must don the role of becoming the broker of technologies and educating enterprise users on compliance and security, it became apparent at the event. Technology integration, IT innovation and service brokerage are some of the skills CIOs need to develop in the cloud era. Lack of trust seems to be the main reason why enterprises are not putting mission critical workloads on public cloud. Bank of England’s Finch just stopped short of saying “never” to public cloud. Take Coca Cola bottling company CIO Onyeke Nchege for instance – he’s planning to put mission critical ERP systems on the cloud but private cloud. EBay runs its website on the OpenStack cloud – but a private version it built for itself. One reason customers cite is that mission critical apps seem to be more static and don’t need fast-provisioning or high scalability. “It is not always about the technology though. In our case our metadata is not sophisticated enough for us to take advantage of public cloud,” said Charles Ewan, IT director at the Met Office. But there are some enterprises such as Astra Zeneca (running payroll workloads on public cloud) or News UK that manages its flagship newspaper brands on AWS cloud. Lack of standards and regulations around cloud adoption, data protection and sovereignty and cloud exit strategies is making cloud adoption messy. Legal technology experts urged users to be “wise” in their cloud adoption until such time that regulations are developed. But regulators and industry bodies including the European Commission, the FCA and Bank of England are inching closer to developing guidelines and regulatory advice to protect cloud users. The more crowded than ever Cloud World Forum saw traditional heavyweights (IBM, HP, Dell, Cisco) rub shoulders with a slew of new, smaller entrants as well as public cloud poster-boys such as AWS, Google and Microsoft Azure. Technology players ranging from chip providers to datacentre cooling services sellers were all there to claim their place in the cloud world. 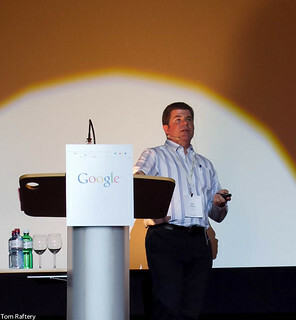 At the Datacentres Europe 2014 conference in Monaco, I had a chance to not just hear Google’s datacentre VP Joe Kava deliver a keynote speech on how the search giant uses machine learning to achieve energy efficiency but also to speak to him individually for 10 minutes. 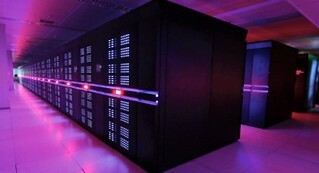 What can smaller datacentre operators learn from Google’s datacentres? There’s a feeling among many CIOs and IT teams that Google can afford to pump in millions into its facilities to keep them efficient. Joe Kava: That attitude is not correct. In 2011, we published an exhaustive “how to” instruction set explaining how datacentres can be made more energy efficient without spending a lot of money. We can demonstrate it through our own use cases. Google’s network division, which is the size of a medium enterprise, had a technology refresh and by spending between $25,000 and $50,000 per site, we could improve their high availability features and improve their PUEs from 2.2 to 1.5. The savings were so high that it yielded a payback of the IT spend in just seven months. You show me a CIO who wouldn’t like a payback in seven months. Are there any factors, such as strict regulations, that are stifling the datacentre sector? It is always better for an industry to regulate itself than have the government do it. It fosters innovation. There are many players in the industry that voluntarily regulate themselves in terms of data security and carbon emissions. One example is how since 2006, the industry has strongly rallied together behind the PUE metric and has taken energy efficiency tools quite to heart. What impact is IoT having on datacentres? Joe Kava: IoT (internet of things) is definitely having an impact on datacentres. As more volumes of data are created and as mass adoption of the cloud takes place, naturally it will require IT to think about datacentres and its efficiency differently. IoT brings huge sets of opportunities to datacentres. What is your one piece of advice to CIOs? You may think I am saying this because I am from Google but I strongly feel that most people that operate their datacentres shouldn’t be doing it. That’s not their core competency. Even if they do everything correctly and even if they have a big budget to build a resilient, highly efficient datacentre, they cannot compete in terms of the quick turnaround and the scalability that dedicated third-party providers can offer. It is astounding to see what we can achieve in terms of efficiency with good old-fashioned testing and development and diligence. The datacentre team constantly questions the parameters and constantly pushes the boundaries to find newer ways to save money with efficiency. We design and build a lot of our own components and I am not just talking about servers and racks. We even design and build our own cooling infrastructure and develop our own components of the power architecture that goes into a facility. It is a better way of doing things. Are you building a new datacentre in Europe? (Smiles broadly) We are always looking at expanding our facilities. How do you feel about the revelations of the NSA surveillance project and how it has affected third-party datacentre users’ confidence? It is a subject I feel very strongly from my heart but it is a question that I will let the press and policy team of Google handle. OpenStack is a free, open source cloud computing platform giving users freedom from vendor lock-in. When it was alleged that Red Hat won’t support customers who use other versions of OpenStack cloud on its Linux operating systems, its president Paul Cormier passionately shared the company’s vision of open-source but steered clear from stating wholeheartedly that it WILL support its users no matter what version of OpenStack they use. Any CIO worth his salt will admit that support services can be a deal-breaker when deciding to invest in technology. Red Hat customers opt for the vendor’s commercial version of Linux (RHEL) over free Linux versions because they want to use its support services and make their IT enterprise-class. This has helped Red Hat build a $10bn empire around Linux and become the most dominant provider of commercial open source platform. So when Cormier says — “Users are free to deploy Red Hat Enterprise Linux with any OpenStack offering, and there is no requirement to use our OpenStack technologies to get a Red Hat Enterprise Linux subscription. And separately, “Our OpenStack offerings are 100% open source. In addition, we provide support for Red Hat Enterprise Linux OpenStack Platform,” — customers are likely to pick Red Hat’s OpenStack cloud on Red Hat operating system resulting in supplier lock-in. Yes, Red Hat has to seek growth from its cloud offerings and as an open source leader, it has to protect the reputation of open cloud as being enterprise-ready. Red Hat’s efforts in the open source industry are commendable. For instance, it acquired Ceph provider Inktank last month and said it will open source Inktank’s closed source monitoring offering. But as the open sourced poster child, it also has the responsibility to contribute more to the spirit of open cloud and to invest more in Open source technology to give users absolute freedom to choose the cloud they like. Competition among cloud providers is getting fiercer. To grab a larger share of the growing market, some cloud providers are slashing cloud costs while others are differentiating by offering managed services. But snatching flexibility and freedom from cloud users is never a good idea. But it will be unfair to single out Red Hat to open up its ecosystem. There’s HP, IBM, VMware and Oracle who are all part of the OpenStack project and who all have their versions of OpenStack cloud. Until then it’s a murky world. What open source? What open cloud? Using cloud services for application testing or software development is becoming a common practice because of cloud’s scalability, agility, ease of deployment and cost savings. But some users are not yielding the cost saving benefit, and in some cases, even seeing cloud costs soar because of a simple error — they are not turning storage instances down when not in use. Time and again purveyors of cloud computing have highlighted scalability as the hallmark of cloud computing and time and again users have listed the ability to scale the resources up and down as one of the biggest cost saving factors of the cloud. But when discussing cloud costs and myths with a public cloud consultancy firm recently, I was shocked to learn that many enterprises that use the cloud for testing and development forget to scale down their testing environment at the end of the day and end up paying for idle IT resources – defeating the purpose of using cloud computing. Building a test and dev lab in the cloud has its benefits – it saves the team time from building the entire environment from the ground up. Also, should the new software not work, they can launch another iteration quickly. But the main benefit is the lower cost. But delirious app testers and software developers may be leaving the instances running and pay for cloud storage for the hours of the night when no activity takes place on the infrastructure. On the public cloud, turning down unused instances and capacity does not delete the testing environment. This means developers can simply scale the system up the next day to start from where they left. But the practice of leaving programs running on the cloud is so common that cloud suppliers, management companies, and consultancies have all developed tools to help customers mitigate this waste. For instance, AWS provides CloudWatch alarms which help customers set parameters on their instances so they automatically shut down if they are idle or underutilised. Another tool it offers is AWS Trusted Advisor – available for free to customers on Business Level Support, or above. It looks at their account activity and actively shows them how they can save money by shutting down instances, buying Reserved Instances or moving to Spot Pricing. “In 2013 alone, it generated more than a million recommendations for customers, helping customers realise over $207m in cost reductions,” AWS spokesman told me. Cloud costs can be slashed by following good practices in capacity planning and resource-provisioning. But that’s at a strategic level while quick savings can be achieved by simple, common sense measures such as running instances only when necessary. Perhaps, it is time to think of cloud resources as utilities – if you don’t leave the lights on when you leave work why should you leave idle instance running on the pay-as-you-operate cloud? That’s $207m IT efficiency savings for customers of just one cloud provider. Imagine. As public cloud provider AWS is looking to expand its datacentre footprint in Europe in the post-Prism world, it may have picked Germany because of the stricter regulations around data sovereignty. But the recent US court ruling asking Microsoft to hand over one customer’s email data held in its Dublin datacentre suggests that data on the cloud, regardless of where it is stored, may not be really private and secure. While AWS has not clearly said it is building a datacentre in Germany, at its London Summit last week, Stephen Schmidt, its vice-president and chief information security officer told me that they are always looking to expand and that a Wall Street Journal article was “pretty explicit” about where their next datacentre might be? The WSJ article quotes Andy Jassy, senior vice president naming Germany as its next datacentre location because of its “significant business in Germany” who could be demanding that their data resides within the country. According to Chris Bunch from Cloudreach, a UK cloud consultancy firm that implements AWS clouds, AWS is growing so fast and have such market dominance that adding capcity for further growth is clearly sensible. AWS will have built one in the region within the next 12 months. Amazon already has three infrastructure facilities in Frankfurt, with seven others in London, Paris and Amsterdam. In addition to these ten Edge locations, it has three EC2 availability zones in Ireland, catering to EU customers. But just as one would hail the potential AWS datacentre in Germany as a credible move to protect user data on the cloud, comes a US magistrate Court judgment ordering Microsoft to give the District Court access to the contents of one of its customer’s emails stored on a server located in Dublin. Microsoft challenged the decision but the judge disagreed and rejected its challenge. “Microsoft’s argument is simple, perhaps deceptively so,” Judge Francis said in an official document, quashing Microsoft’s challenge. “It has long been the law that a subpoena requires the recipient to produce information in its possession, custody, or control regardless of the location of that information,” he said. Well, perhaps we still have a long way to go to see the rules of data sovereignty upheld, but with AWS’s growing customer portfolio, it will be good news to have public cloud data reside in Germany which has one of the strongest and toughest data regulations around the world.